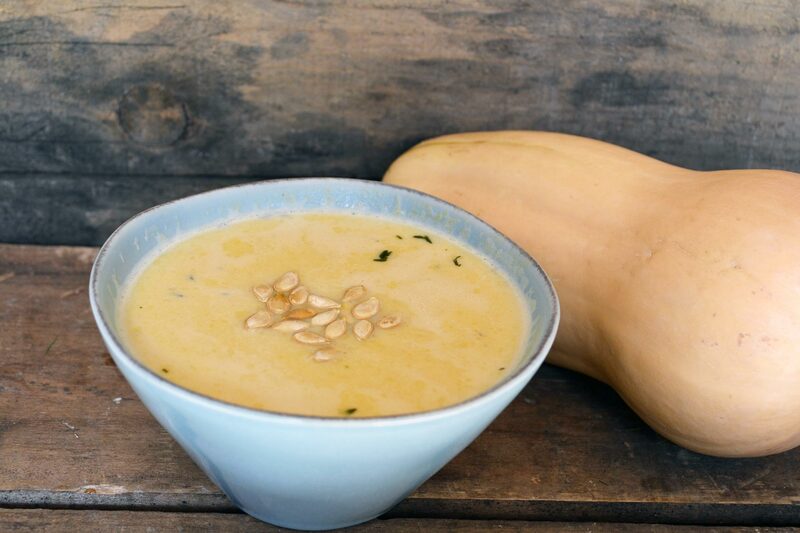 What better way to celebrate fall than with this butternut squash soup? Preheat the oven to 300 degrees Fahrenheit if you're roasting the seeds. Peel the butternut squash, then cut and half. Remove the seeds and place in a colander. Remove the strings from the butternut squash seeds and rinse to get off all the extra squash bits. Set them on a clean towel and pat dry. Spread the squash seeds on a baking sheet and drizzle with the olive oil, stirring to coat. Season with salt and bake for 10-15 minutes, or until the seeds are starting to turn golden brown. Remove from the oven and put the seeds on a plate to cool. Cut the butternut squash into 2-inch sized chunks. In a large saucepan, melt the butter over medium heat. Add the onion, garlic, thyme and cinnamon and stir. Cook for 5-7 minutes, or until the onion is softened, stirring occasionally. Add the squash, broth and half and half to the pan and bring to a boil. Reduce the heat to a simmer and cook about 20 minutes, or until a fork easily inserts into the squash. Using an immersion blender, or working with a blender in batches, puree the soup until smooth. Season with salt and pepper to taste. Top with butternut squash seeds if desired and enjoy.